We have no success in dyeing polyester fabrics but there are instances where the fabric is made up of a mixture of yarns, including polyester, and in such cases we may be able to achieve some degree of light colour. Dry Clean or Machine Washable Fabric Advice. We can overdye printed and multicolour fabrics to very good effect with the original pattern or print still visible in the new shade. This works particularly well on materials with a floral, checked or stripe pattern. If the pattern is in a very dark shade such as black, we will not be able to dye over this; however the black printed pattern may look equally effective against the new colour background. 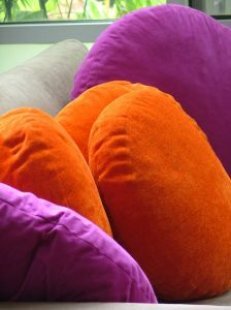 It is extremely difficult to acheive a solid block colour on these types of fabrics. If the material is 100% cotton it may be possible to strip the pattern out but a faint outline usually remains. Darker dyes provide the greatest chance of successful cover-up in these situations. If the material is of mixed fibres the results are unpredictable as the different fibres will take the dye to varying extents. Please be aware that some fabrics such as those with a high polyester content or wool will not dye satisfactorily. If in any doubt you are advised to send a sample piece before proceeding. Decorated Fabrics - Multicoloured Textiles or Screen Printed Fabric. If you have any doubt please call us.